Whiskey Creek Steak House, a Keyport restaurant that experienced a brief and ill-fated brush with reality TV fame in 2012, has shut down for good. The TV show crew stripped Whiskey Creek of its kitschy Old West interior and nixed popular menu items. The owners came to regret changes made by “Restaurant: Impossible.” They moved the restaurant to a larger space across the highway in 2013 and later turned the business over to employees. 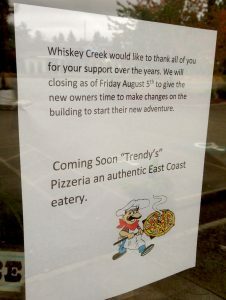 Whiskey Creek closed without fanfare last week. It’s website and social media pages are already offline. I’m hoping to get in touch with owners of Trendy’s to learn more about their plans.